Coughing is a reflex action that clears mucus, irritants and allergens (such as dust, smoke, or pollen) from your airways. Your cough may be dry, with a tickling or itching sensation, and without any phlegm (thick mucus). Unlike a ‘dry cough’, a ‘chesty cough’ will present with phlegm in the lungs. Your cough may be due to an underlying condition (asthma, allergies, and environmental irritants are regular culprits of an ongoing or persistent cough). A cough is also a common symptom of the influenza virus, a chest infection, or the common cold. There are symptoms that it is important to be aware of with regard to a cough – if you are coughing up blood, feel pain in your chest, or are noticing shortness of breath, we advise you to make an appointment to come and see us as soon as possible. Other symptoms which are more unusual but which can indicate a serious underlying condition include sudden, unexplained weight loss, changes to your voice, and swellings or lumps in your neck. Depending on the doctor’s assessment, you may be referred to a specialist for diagnosis. Tests that may be recommended include chest x-ray, phlegm analysis, allergy testing, and measurement of your lung capacity. A proper diagnosis will determine the mode of treatment. It is best to follow a doctor’s advice with regard to treatment, rather than managing symptoms at home. Chronic conditions flaring up (asthma, chronic obstructive pulmonary disease, chronic bronchitis). Inhaled irritants like dust or smoke. In rare cases, persistent cough can be a symptom of more serious conditions like lung cancer, heart failure, pulmonary embolism, or tuberculosis. It is only in rare cases that a cough is caused by a serious condition, but we recommend that you come in to get it checked out and receive a proper diagnosis, particularly if it has gone on for a long time or if you experience chest pain or are coughing up blood. 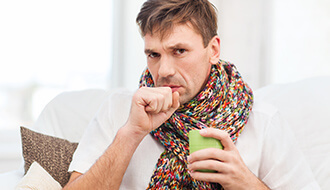 What are the symptoms of a serious cough? It is important to be aware of signs of a more serious cough, such as a cough that does not go away after a couple of weeks, a severe cough, a cough that does not seem to be getting better, or a painful cough. How does GORD (acid reflux) lead to a cough? When you have acid reflux, liquids from the stomach rise into the oesophagus. If they rise high enough to reach the throat, this can irritate the throat lining and lead to a cough. You may have this kind of cough without noticing other stomach symptoms.